CANTON, Mass. (August 4, 2014) – August is National Coffee Month, and Dunkin’ Donuts is kicking off the month with some hot news for coffee lovers looking to add a little more flavor to a sweet summer. 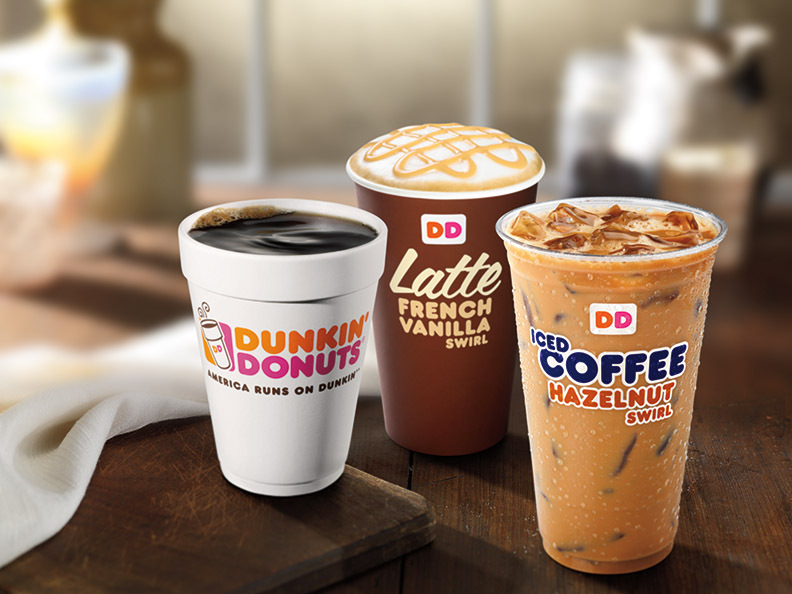 Dunkin’ Donuts, America’s all-day, everyday stop for coffee and baked goods, today introduced new French Vanilla and Hazelnut Swirls for coffee beverages. Dunkin’ Donuts also unveiled new Coffee Creme Donuts, the brand’s first donuts made with Dunkin’ Donuts’ famous Original Blend Coffee. A permanent addition to Dunkin’ Donuts’ menu, new French Vanilla and Hazelnut Swirls are a sweeter, creamier take on the brand’s most popular coffee flavors. These rich and creamy flavor swirls offer guests a delicious new way to customize their hot and iced coffee, lattes or Frozen Coffee Coolatta® to create a sweeter, more indulgent beverage. Dunkin’ Donuts also serves coffee drinkers a number of other flavor options, including Caramel and Mocha Swirls, as well as unsweetened and sugar-free flavor shots such as French Vanilla, Hazelnut, Caramel, Coconut, Toasted Almond and more. All Dunkin’ Donuts flavor shots are part of the brand’s DDSMART® menu of better-for-you items. Dunkin’ Donuts guests can also enjoy French Vanilla and Hazelnut coffee flavors at home. Both varieties are available at participating Dunkin’ Donuts restaurants in one-pound bags of packaged coffee for a suggested retail price $8.99, as well as Dunkin’ Donuts’ K-Cup® packs, for use with the Keurig® K-Cup® Brewing System, for a suggested retail price of $9.99. For coffee fans seeking a sweet treat this summer season, Dunkin’ Donuts is introducing a perfect combination of two Dunkin’ favorites with new Coffee Creme Donuts, the brand’s first donuts made with Dunkin’ Donuts’ famous Original Blend Coffee. The donuts are available in two varieties: new Glazed Coffee Creme Donut features a glazed yeast shell filled with coffee buttercreme and drizzled with chocolate icing, while the new Coffee, Creme & Sugar Donut features a yeast shell filled with coffee buttercreme and finished in powdered sugar. Both donuts are available for a limited time at participating Dunkin’ Donuts restaurants nationwide.